Tamil Nadu: Actor-turned-politician Kamal Haasan on Wednesday, March 20 cleared the air on whether he will enter the Lok Sabha elections by announcing candidates for 21 constituencies, including Puducherry. In south India, especially in Tamil Nadu, cinema plays an essential role in the making of politicians, and formation of government. The state has enjoyed the rule of many chief ministers who belonged to the glam world, like J Jayalalitha, M Karunanidhi and MG Ramachandran. The 2019 Lok Sabha elections would see superstar Kamal Haasan’s party Makkal Needhi Maiam in the midst of the political fray. 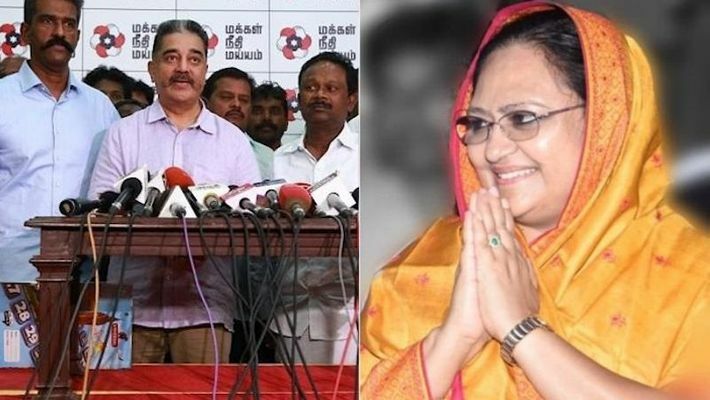 Interestingly, Kameela Nasser, wife of veteran actor Nasser, has also joined Kamal's party, and will take on two-time MP Dayanidhi Maran from the DMK and Sam Paul from the PMK for the Chennai Central seat. Kameela is also the executive committee member of MNM, and it is said that she is a close aide of party founder, Kamal. The ruling party in Tamil Nadu, which is AIADMK is not fielding any candidate from Chennai Central but will support its alliance partner Sam Paul from the PMK. Following is the list of MNM's Lok Sabha candidates who will contest in 21 constituencies including Puducherry on April 18.